Turkey says it has handed audio recordings of Jamal Khashoggi's death to the United States and other Western countries. According to Turkish officials, the recordings prove that Khashoggi's murder was premeditated. Last month, Gina Haspel, director of the C.I.A., traveled to Turkey, where officials reportedly played the audio recordings for her. It is unclear if copies of the recordings were later physically handed over to the U.S., or if U.S. officials were allowed only to listen to the recordings. According to The New York Times, "For the C.I.A., possessing a physical copy of the tape would be important to verify its authenticity, determine how it was made and analyze its contents independently." Khashoggi, a journalist and critic of Saudi Arabia's government, was killed after visiting the Saudi consulate in Istanbul to obtain a marriage license last month. Saudi officials have admitted its operatives killed Khashoggi, but denied involvement by Crown Prince Mohammed bin Salman. 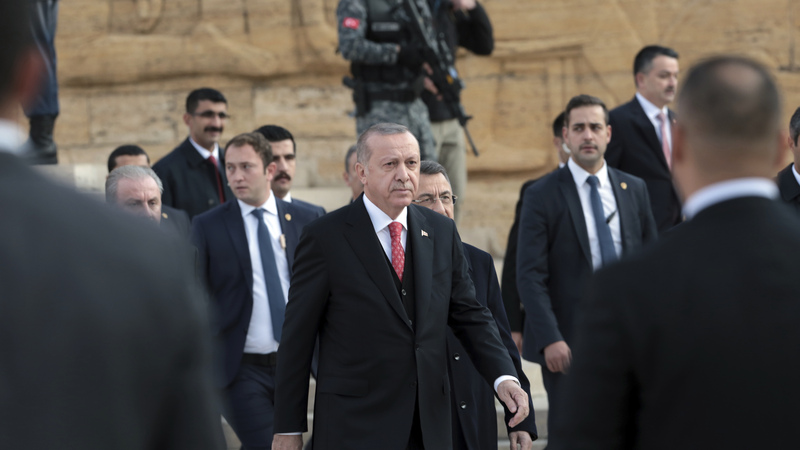 At a news conference in Ankara, Turkey on Saturday, Turkish President Recep Tayyip Erdogan said, "We gave them the tapes. We gave them to Saudi Arabia, to America, to the Germans, the French, to the British, to all of them." He also insisted Saudi Arabia step up transparency in its investigation of Khashoggi's death. "Saudi Arabia must respond to our good will, and be just, and clear themselves of this stain," Erdogan said. The statement by Erdogan puts pressure on U.S.-Saudi relations. The U.S. has levied sanctions on some Saudi Arabians directly linked to Khashoggi's killing, but so far has not imposed tougher sanctions on the country. In recent weeks, U.S. officials, including Defense Secretary James Mattis and Secretary of State Mike Pompeo, have called on Saudi Arabia to end airstrikes on Yemen, and are reportedly suspending mid-air refueling of Saudi Arabian military aircraft involved in the airstrikes. In a statement Friday, Saudi Arabia took responsibility for the decision. "In consultation with the United States" it had requested the end of in-flight refueling, Saudi Arabia said. "The Kingdom of Saudi Arabia, and the member countries of the Coalition to Support legitimacy in Yemen, continually pursue improvements to military professionalism and self-sufficiency," the statement read, according to NBC News. Saudi Arabia's war with Yemeni rebels began four years ago, and has evolved into a humanitarian crisis, with at least 10,000 killed, according to U.N. estimates, and a resulting famine devastating the country. U.S. support for the Saudi-led war has faced growing criticism.